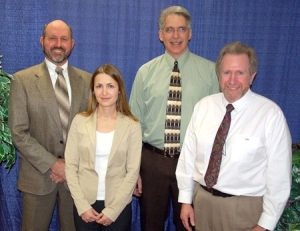 From left, Bernard Bauer, Dean of the Irving K. Barber School of Arts and Sciences, presented graduate student Elinor McGrath with the first EBA Engineering Consultants Ltd. Graduate Scholarship in Hydrogeology, along with Scott Schillereff, Principal Consultant of EBA and Tim Murphy, Principal Engineer. UBC Okanagan graduate student Elinor McGrath recently received a $3,750 scholarship – half of a two-year renewable award – from EBA Engineering Consultants Ltd., which has committed $22,500 over three years to establish the award. The EBA Engineering Consultants Ltd. Graduate Scholarship in Hydrogeology aims to support students in the Irving K. Barber School of Arts and Sciences studying hydrogeology, with a focus on geoexchange or geothermal energy, water quality or quantity, environmental remediation or mining. The award is payable over two years, at $3,750 per year. Renewal of the scholarship in the second year is subject to continued registration in the school and achievement of satisfactory academic standing. McGrath is the first student recipient of the EBA graduate scholarship. Raised in Germany, she moved to Canada approximately eight years ago, completing her undergraduate degree in geography at the University of Calgary. After working for an environmental consulting firm for several years, McGrath commenced her studies at UBC Okanagan under the supervision of Dr. Adam Wei (forest hydrologist) and Dr. Craig Nichol (hydrogeologist). Currently McGrath is working on a project that partners UBC Okanagan with the Pacific Salmon Foundation and the Fraser Salmon and Watersheds Program, in collaboration with various levels of government agencies and several local First Nations organizations. The project focuses on surface water and groundwater interactions and how they affect fish habitat in a stream in the north Okanagan. “We in the Barber School continuously strive to provide the best educational experiences possible to our students to help them become educated global citizens who are fully prepared to meet the challenges of an ever-changing world,” says Bernard Bauer, Dean of the Irving K. Barber School of Arts and Sciences.